In an inspiring video interview, world-renowned primatologist Jane Goodall tells Dean of UNSW Science Emma Johnston that the resilience of nature and the indomitable human spirit give her hope for the future. There were moments of fear in the rainforest, when wary chimpanzees threatened her with branches. And great shock and sadness when she realised our closest relatives were dying out across Africa, due to deforestation and loss of habitat, hunting for meat, and a live animal trade exploiting them for entertainment. 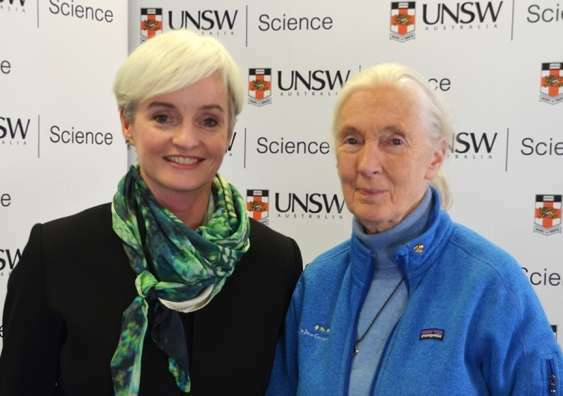 But in an inspiring interview, world-renowned British primatologist and activist Dr Jane Goodall also tells UNSW Dean of Science Professor Emma Johnston that, at 83 years of age, her overwhelming feeling is one of hope for the future. The resilience of nature and the indomitable human spirit that makes people continue the struggle for change give her confidence, she says. So do new technologies that let people around the world raise their voice in unison on issues such as climate change, or work out their own environmental footprint each day so they can alter their lifestyles. "But my main hope for the future are young people," she tells Professor Johnston. Those who have "chosen to do projects to make the world better for people, animals and the environment and who are learning there really are no distinct barriers between people of different nations, cultures and religions." As a young woman with no scientific training, Dr Goodall began observing the wild chimpanzees of Gombe Stream National Park in Tanzania in July 1960. She quickly discovered they made and used tools – challenging understanding about what it meant to be human. In 1986, she left research to become a full-time conservation activist and still travels the world almost 300 days of the year talking about her experiences and vision. Jane Goodall Institutes have been established in 36 countries including Australia and young people in 99 countries take part in her Roots and Shoots program fostering respect for living things.